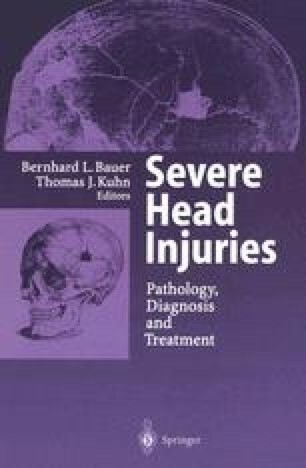 Approximately 50% of patients with head injuries die either at the scene of the accident or on arrival at hospital , most of them from secondary insults to the already injured brain. Adequate prehospital care is crucial for these patients. The concept of preventable death was first defined by Van Wagoner  in 1961. Jennett and Carlin  referred specifically to patients with head injuries and noted that most preventable deaths from head injury are caused by inappropriate prehospital management. As early as 1958 MacIver et al. adressed the problem of prehospital hypoxia  and stated that “anoxia is the main cause of death in patients who survive the accident but die at a later stage.” Recognizing that almost one-third of trauma deaths in nondesignated hospitals are preventable , the American College of Surgeons  and the Joint Section of Trauma of the American Association of Neurological Surgeons and the Congress of Neurological Surgeons have developed  criteria for designated (neuro-)trauma centers. Development of these specialized regional trauma centers has contributed enormously to improved survival and outcome for trauma patients.